Diane and I recently attended a performance by the four comedians from the TV show Impractical Jokers. It was my birthday present from Diane but like many good presents, we both got to enjoy the gift. I knew they were really funny and popular but I was amazed at just how popular they are. There was a full house at the Times Union Center in Albany, NY, which has a capacity of 17,500! They sell out multiple shows at Radio City Music Hall and Madison Square Garden in New York City, too. Here’s how they describe the show: “The Tenderloins is a New York-based comedy troupe whose four members—Joe Gatto, James Murray, Brian Quinn and Sal Vulcano—are the creators, executive producers, and stars of truTV’s hit series Impractical Jokers. Now in its seventh season, Impractical Jokersfollows The Tenderloins as they coerce one another into doing public pranks while being filmed by hidden cameras.” This show is like Candid Camera on steroids (if you’re old enough to remember that show). 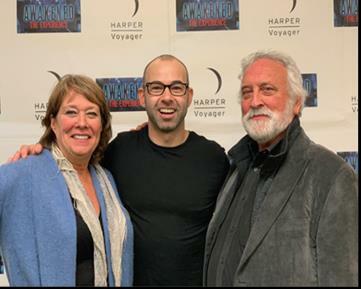 Diane and I got to meet James Murray (Murr) afterwards for a book signing. Diane asked him about one of the pranks in which he was given the maximum legal injection of Novocain and then had to give a lecture to an unsuspecting class of culinary students. Of course he could barely talk but was able to drool successfully. He told us he is now allergic to Novocain. That tells you how far they’ll go for a laugh. It’s a riot; check it out. We all need a good laugh these days. As someone once said, humor is medicine for the soul. Unless you are full of Novocain.